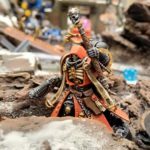 Chaos arrives, on the wings of plague! The last two months of fighting began with a Tyranid and Ork horde dropping on the forgotten Imperial outpost of Solypsus 9. The horde quickly overran the Hab Blocks, but Imperium armies successfully shored up the Mine, Lab, Comms Tower, and Starport. In subsequent fighting the Spoilers took the Laboratory but the displaced Order troops reestablished themselves at the Generator. No doubt delayed in The Warp, this month the Legions of Discord finally arrived, hungry for battle. 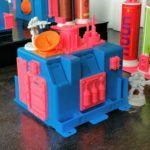 Fighting renewed focused around the Lab and Hab Blocks. First Round: Dark Eldar and Necron Spoilers correctly anticipated the primary threat on the Laboratory, making a move against the center of the settlement just as Imperial Guard and Sororitas troops attacked from there. The Spoiler attack though was disrupted by Chaos Daemons and the remaining Necron and Tyranid defenders in the Lab overrun. 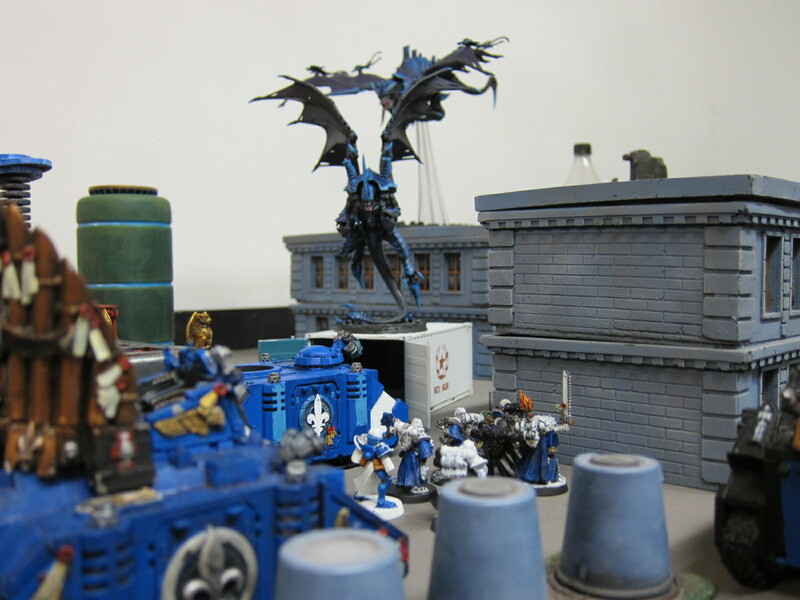 Meanwhile, yet more Daemons also clawed out of The Warp into the heart of the Hab Blocks, overwhelming the defenders and terrorizing the populance. Second Round: Chaos Daemons and Imperial Guard both moved on the Necrons and Tyranids regrouping on open ground, but the Order was soundly rebuffed even as the Spoilers were crushed. On the hunt for fresh victims to buff up their strength, Dark Eldar supported by Necrons also successfully raided the Hab Blocks. Third Round: Fighting spilled out all over the settlement, with Daemons and Kingbreakers making attacks on open ground to scour fleeing troops. 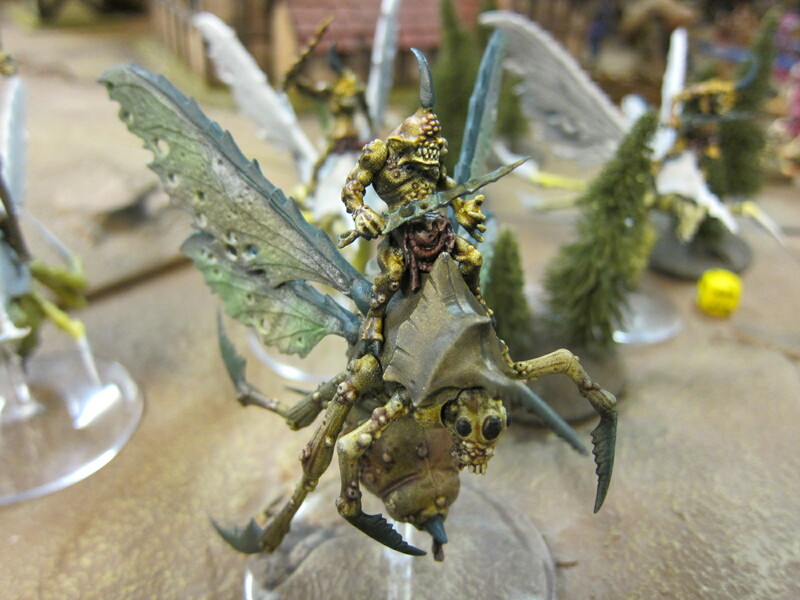 Dark Eldar were routed from the Hab Blocks in the closing moments by Chaos Marines working in tandem with other denizens of Commoragh to betray their kind. 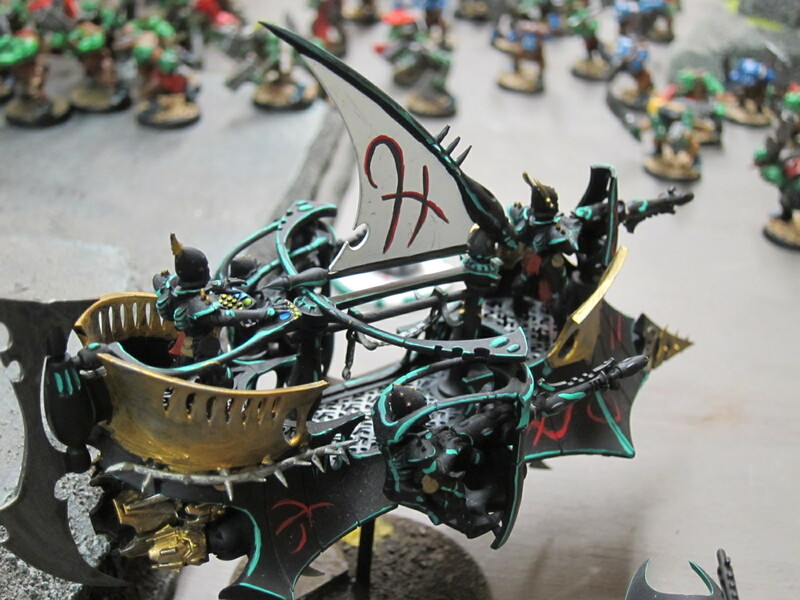 Dark Eldar swoop in from the skies. 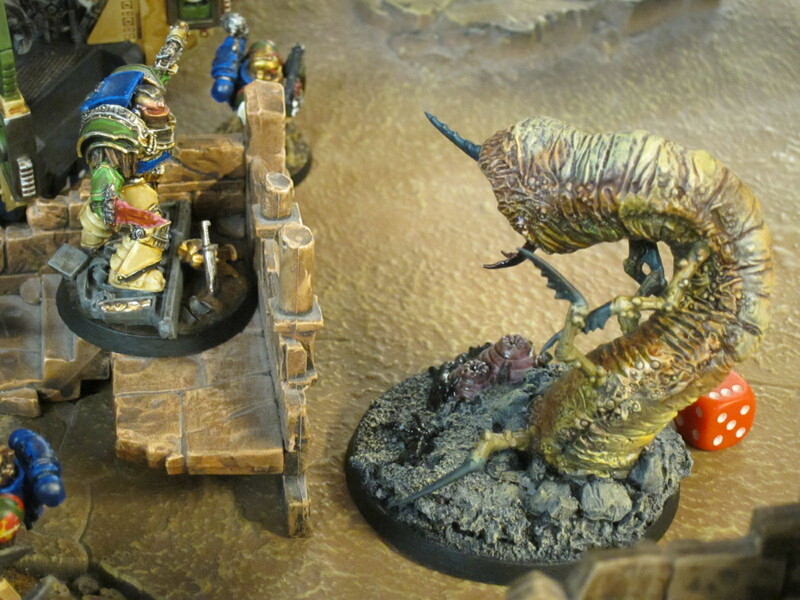 Captain Angholan faces off against the wormlord. It was very clear very early on that all of the games would be extremely pressed for time in the doubles format, so I left out some of the narrative campaign elements originally planned. They’ll just have to make an appearance in next month’s finale. An Ork player did not have a partner, so I wound up playing two matches with him and then a third on my own after he left. Round 1: The opening deployment setup split up each team, and already not having a ton of obvious synergy with the Ork Green Tide we basically wound up playing two separate games on opposite flanks of the table. Facing oncoming Chaos Marines, I managed to sacrifice a Rhino and some Marines to draw their beast pack into combat with my Terminators. Otherwise I was concerned that the beasts would literally just run around them, the Kingbreakers never being able to tag them before they could swoop around to my home objectives. 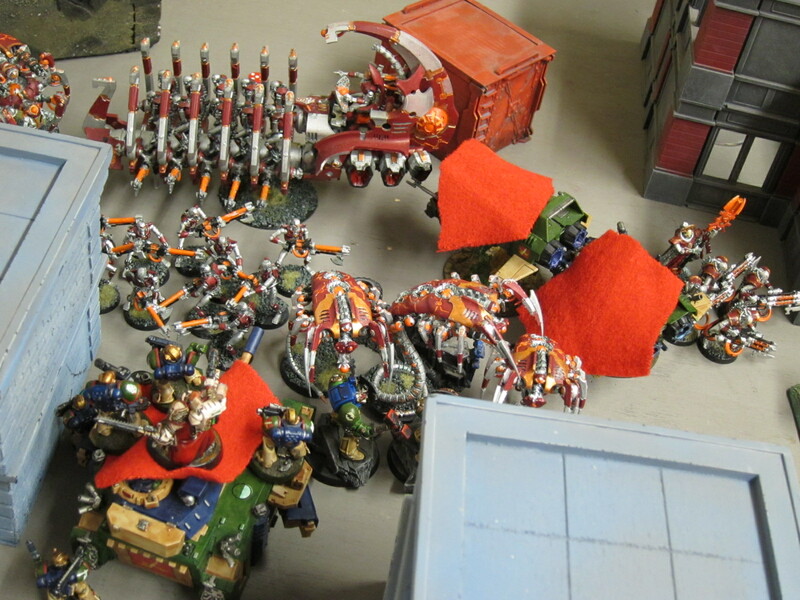 Unfortunately though the Terminators all failed their 2+/3++ saves and were swept off the field en masse. That left nothing with a realistic chance of stopping the Juggernaut lord from sweeping through all of my rear infantry. The Orks meanwhile were largely contained by opposing Dark Eldar, and the whole thing went down to a loss. 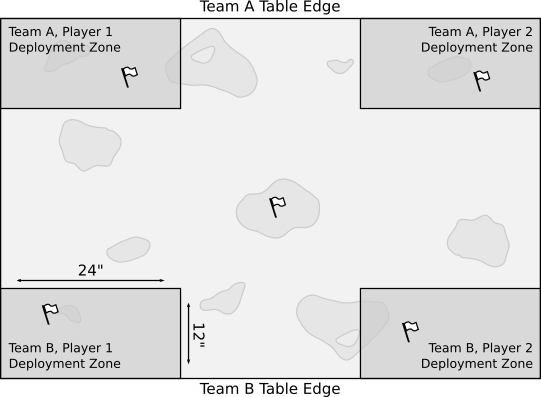 Split deployment zone setup for round 1. Round 2: Next, the opposing Dark Eldar + Necron team did a good job on mutual target priority and support in this Maelstrom battle. They wound up fighting as a real combined force, first primarily whittling away the Kingbreakers and then shifting focus to the Orks, still operating largely as distinct armies. In the early going though we established control over most of the board and leapt ahead. 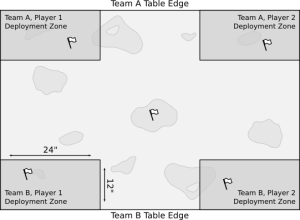 At one point we drew the Commander tactical objective (1 VP per objective) and were easily able to claim a whopping 5 of 6 objectives that turn. Several other objectives cards were also easy pickings. After that though the Kingbreakers were spread all over and picked apart, while the Ork blob couldn’t effectively claim new tactical objectives. The Spoilers slowly clawed their way back from a substantial deficit and eventually won by a few points. The mob swarms through the rocks. In the first two rounds we were a bit disadvantaged as it just wasn’t clear how my Marines could work well with the Ork mob. 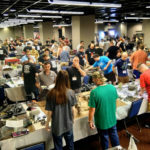 With over 100 Orks crammed into 1000 points, they simply filled an entire sector of the board. Mixing the armies together evenly or putting the mob forward would have limited the more mobile Kingbreakers from moving about or engaging in longer range shooting. Conversely, putting the mob on rear defense would have forced the Kingbreakers’ defensive units into an awkward role. So, we wound up essentially splitting the board into two flanks. That would be fine as such a mass of Orks could hold down an entire side, but they were grouped up into a Green Tide formation, making the vast majority of the army a single unit. That made them near impossible to dislodge, but rendered that huge points percentage only able to hold a single objective. 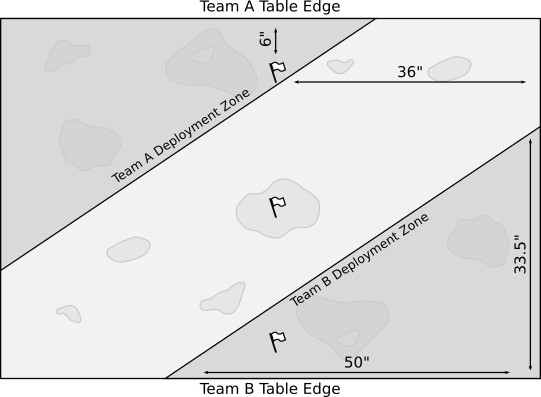 Combined with being on foot, the blob just wasn’t able to effectively hold down all the objectives on its side, particularly in the more dynamic Maelstrom mission. 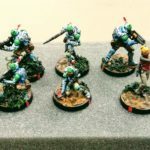 We spent as much time trying to figure out how to move the other units of Gretchin and so forth through our own troops to actually claim objectives as we did working out offensive tactics. Overall then, we had an awkward mix. Kingbreakers could take objectives easily, but needed support from a longer lasting force. 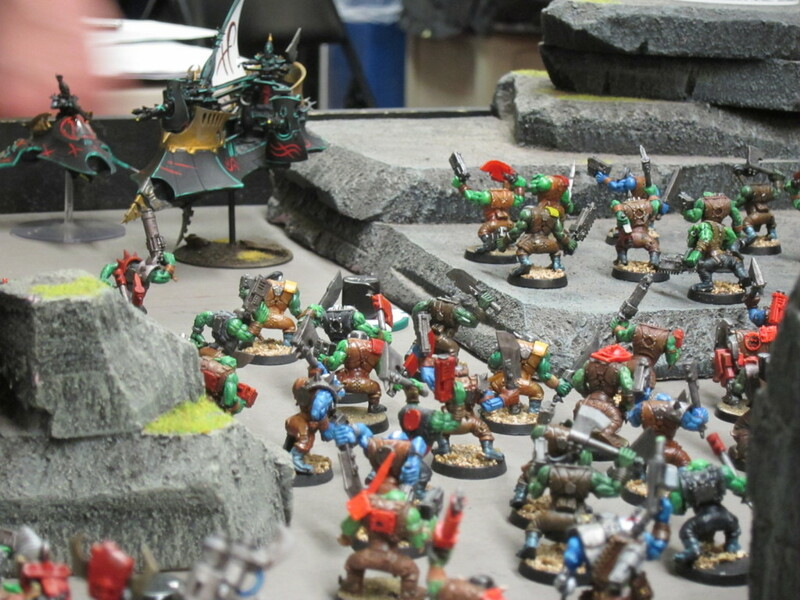 Orks were longer lasting, but couldn’t really move to support or take objectives themselves. Necrons and Kingbreakers pile in. 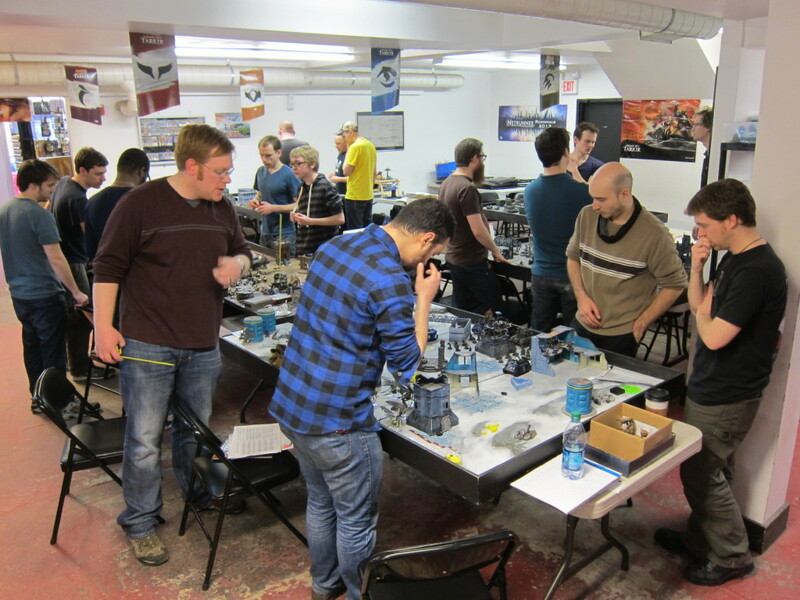 Round 3: The final round was an old school matchup of 2000 points of Kingbreakers versus Chaos Daemons. I gave myself little odds of winning on the primary objective of annihilation, so from the start I focused on the secondary objective of holding markers. In addition, given that every match had been pressed on time and the opposing Chaos army particularly slow-playing with all its spells, Warp Storms, and other trickery, I strongly assumed the game would make it at most to Turn 4. This was born out when we only made it through Turn 3 and my army had taken heavy losses but few units been broken, while also claiming two of the markers and Linebreaker as well as First Blood. 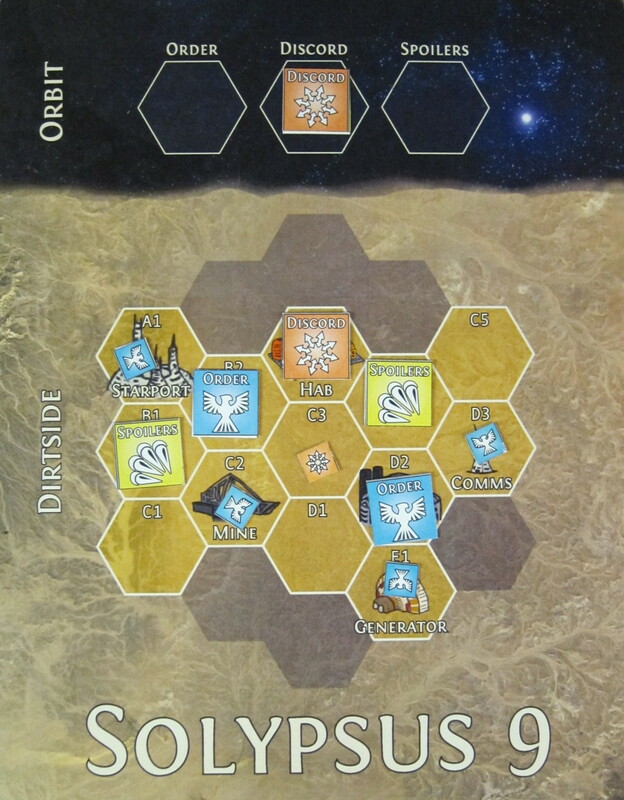 That eked out a win and nothing substantial would have changed in a turn, but a full five or six turn game would have swung hard the other way as units were wiped and markers forfeited. Key here was that I had exactly what I needed to quickly grab the three secondary objectives and start off having to be dislodged, rather than fighting my way in: A bunker to put on home base, tanks to roll onto the midfield, and Drop Pods to go after the opposing marker. In general Marines can also just take a fair bit of abuse before they crumple. Terminators did a good job tying up several incoming units long enough that they had no chance to slaughter my squishier rear units. Captain Angholan (Vulkan) , Master Sauvon (Harath Shen), and Squad Scolirus similarly hung tough to draw out combat with both a Greater Daemon and a Soulgrinder in order to claim the far objective. Meanwhile, the other units did their best to not die and to make what contributions they could, like Sternguard in a single volley taking down a Nurgle Beast skulking about on the far flanks, for First Blood. 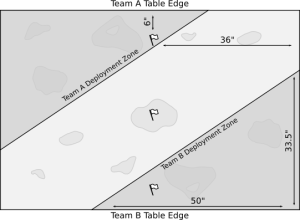 Placement of the three secondary markers. Next month will be the conclusion of our Solypsus 9 campaign. We’ll be running a 1000 -> 1500 -> 1850 point escalation format, with each list having to contain the previous list, as the armies and alliances hurtle into the endgame for control of the planet. Don’t miss out!